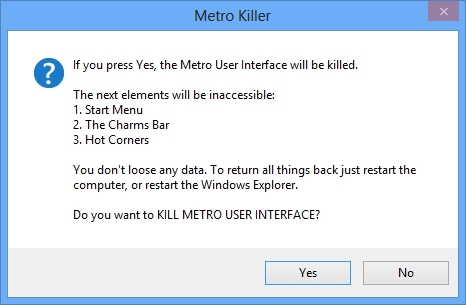 Metro Killer disables the Windows 8 Metro User Interface, including new Windows 8 start menu and the Charms Bar. We recommend using Metro Killer with True Launch Bar to get access to your applications and get the "Turn Off Computer" button. Metro Killer does not require installation. Just run it and enjoy. To return things back, you have to restart your computer or kill and restart the Windows Explorer (explorer.exe). Metro Killer is free. You can use this utility as you want. Metro Killer can be used on Windows 8. Metro Killer supports both 32 and 64 bit systems.